A toolbox for online analysis to observe plant data in space and time. Drone-measured values are then plotted as unprecedented agronomic indicators: vitality, leaf area and grass cover in between rows. Users can then monitor the development of the vine, identify trends and make statistical comparisons. A planning tool collects the measures to help users plan tasks in the field. Depending on the areas of a plot highlighted in the analysis, they can enter location-based instructions: fertilising, pruning, work on growing vines. The tool then generates a bespoke modulation map. 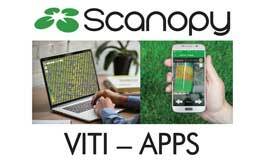 These maps are then used for modulation in winegrowing thanks to mobile VITI-APPS. Whether they are walking or driving their tractor, users are tracked through their Smartphones, which then display work instructions based on their movements through the rows. They receive a sound alert every time they enter a new area. Users therefore have a range of tools at their disposal to centralise, analyse and make use of mapping data in the field: “measurement, analysis, action”.